For some people, a cruise holiday means getting away from the rigmarole of everyday life and immersing yourself in the complete unknown. For others however, it means enjoying the finer things in life – think great food, daily trips to the spa and lots and lots of retail therapy. If you like nothing more than to flash the cash and indulge in the things you love during your holiday, here’s our pick of the best cruise lines for the self-proclaimed shopaholic. 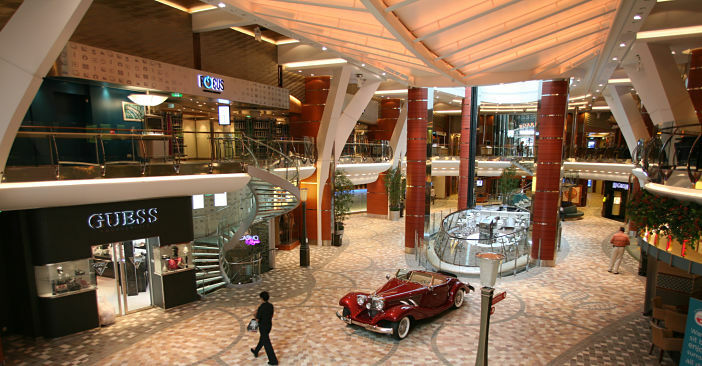 Luxury, extravagance and lavishness underpin every facet of life aboard a Celebrity Cruises vessel – including shopping. Each ship in the Celebrity fleet features a luxury, European-inspired retail deck, where passengers can discover an array of prestigious designer brands – from Michael Kors and Tag Heuer, to Kate Spade, Cole Haan and Furla. If you’re on the look out for bargains, it pays to visit one of Celebrity’s Special Trunk Shows, which take place on the majority of Celebrity sailings. Trunk shows offer passengers the opportunity to purchase watches, jewellery and perfumes at great, value for money prices – all of which are 100% duty-free. As one of the world’s biggest and most successful cruise lines, Royal Caribbean has a tendency to attract the biggest names in fashion, technology and jewellery to sell their wares aboard its twenty-strong fleet. For the proverbial shopaholic, that means it’s possible to spend a full day exploring the retail opportunities on-board – without once wishing you were on dry land. From luxury watches and jewellery, to fashion, beauty products and the very latest technology – Royal Caribbean offers it all. Discover a new range of luxury Bobbi Brown skincare. Treat your other half to a beautiful set of earrings from Regalia. Indulge in a classic Bvlgari timepiece. Or purchase new formal eveningwear from the likes of Tom Ford. The choice is yours with Royal Caribbean. When it comes to shop as you sail retail, no cruise line does it quite like Norwegian Cruise Line. Aboard each of the line’s roster of luxury vessels, passengers can peruse a seemingly never-ending selection of luxury retail outlets – all of which benefit from duty-free pricing. Whether you need to stock up on suntan lotion or want to treat yourself to a new party dress – Norwegian’s on-board boutiques and stores transport guests to retail utopia. If you’re interested in purchasing a truly memorable souvenir during your cruise with Norwegian, why not attend one of the cruise line’s regular Art Auctions at Sea. Here, original artworks displayed across each individual ship are put on sale and sold to the highest bidder. Check the daily newsletter for scheduled auction times. Whether you want to shop ‘til your drop, pick up a keepsake for family and friends, or simply stock up daily essentials – thanks to duty-free pricing, a cruise ship is the perfect place to flash the cash in the name of retail therapy. To book your next cruise holiday, visit the Cruise1st Australia website or call our team on 1300 857 345. Book your Shopaholic Cruise Today! Images sourced via Celebrity Cruises Press Center, Royal Caribbean Press Center and Norwegian Press Center. Credits: Celebrity Cruises, Royal Caribbean Cruises and Norwegian Cruise Line.